This summer, try centering your entire Independence Day around patriotic foods. The sky's the limit when you think about how many red, white, and blue food combinations you can come up with. Here are a few to spark your creativity. Why not make a patriotic breakfast for the Fourth of July? Honestly, this is probably the easiest meal to make red, white, and blue, since fruit comes naturally in all of these colors. It's so easy it's almost cheating, don't you think? This breakfast recipe will have both your kids and guests clamoring for more - what kids won't say yes to a creamy, colorful start to their day? Serves four. Place one cup of yogurt in four different bowls. 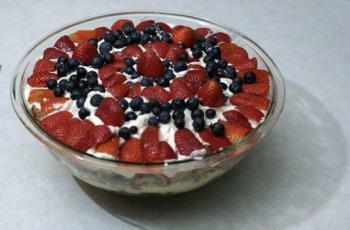 Try using festive bowls that are patriotic, or at least go with the red, white, and blue theme. Smooth yogurt with the back of a spoon. Create stripes of strawberries and blueberries, making sure to leave a few white stripes of yogurt between the rows of fruit. Drizzle with honey before serving. Serve chilled. This dish can be made the night before and then covered and left in the fridge for a great breakfast first thing in the morning. If you're feeling extra sweet, top with a dollop of whipped cream! This nacho recipe definitely counts if you're looking for easy patriotic recipes. This dish can be thrown together in about ten minutes and will please folks of all ages. Kids will love eating with their hands and older guests will love the colorful presentation! In a small pot, heat refried beans until they are piping hot. Quickly spread beans thickly onto a plate, then sprinkle with cheese so that the cheese melts over the beans. Once the cheese is melted, cover with a thin layer of salsa. Top salsa with a 1/2-inch layer of sour cream. Stick blue corn chips throughout the dip and serve with a large bowl of chips. When you think of easy patriotic recipes, you might not at first think about pizza. But why not? Pizza is red (tomato sauce) and white (cheese), so you just need to find a blue ingredient to add. While there aren't many savory blue ingredients out there, there are a few. 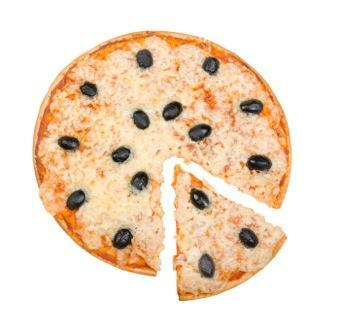 Eggplant is a great addition to pizza, or if you're not a fan, black olives have a slight purple tinge. Prepare pizza crust to specifications on package. Spread tomato sauce onto crust, making sure to cover evenly. Sprinkle with cheese, again making sure to coat evenly. Lay eggplant slices in a star pattern on the pizza or try stripes of eggplant and more tomato sauce. Sprinkle with sea salt and bake pizza according to instructions on pizza crust package. 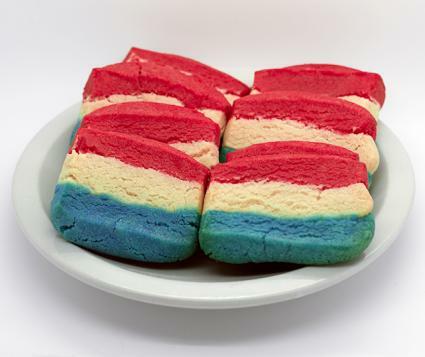 These red, white and blue sugar cookies taste delicious, and they'll look fabulous on your table. They also easier to make than you might think. Whip the egg white and stir the margarine and vanilla into it. Using a different bowl, blend together the dry ingredients. Combine the wet and dry mixtures until blended. Divide the dough into three equal sizes and place in three separate bowls. Add the red coloring to one bowl, the blue to another, and leave the last one white. You may need to knead the dough to get the color distributed evenly. Roll and form into equally shaped rectangles about 4 x 12 inches. Then carefully stack the colors. Cover with wax paper and chill for an hour. Remove dough from the refrigerator and cut it into 1 x 12 inch strips. Cut the cookie dough strips into 3-inch bars, and bake for 10 to 12 minutes. With recipes like these, you can lay out a spread that leaves no one in doubt of your enthusiam for Independence Day. Give all of these recipes a try or just add a couple to whatever party menu you already have planned. Then sit back and let the festivities commence.